“SORRY, THANKS” wins the ADRIENNE SHELLY DIRECTOR’S GRANT! This actually happened back in September … but that was before we had NEWS sharing capabilities! So, slightly belatedly, a big update: Dia was awarded the Adrienne Shelly Director’s Grant for Sorry, Thanks, at IFP’s Independent Film Week, here in New York. Needless to say, the grant is not only an incredible help towards finishing the film, but an enormous honor. We are thrilled and humbled. Adrienne Shelly was a supremely talented writer/director/actress (and damn funny)—everyone who’s seen her celebrated Waitress knows as much. But she was also (as evidenced amply by the friends who continue to work in tribute to her memory) a singularly beloved, fiercely determined creative spirit. For the past two years, the Adrienne Shelly Foundation has been a key support to female independent filmmakers who are hard at work rallying to get their own stories up on the big screen. The director’s grant is tremendously important: not only because it acknowledges that female directors are up against a glass ceiling, but because it’s a step towards shattering said ceiling. JEN WINS WOODSTOCK EDITING AWARD! 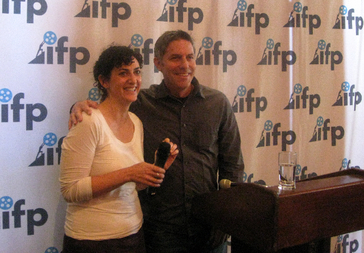 Jennifer Lilly, our incomparable Sorry, Thanks editor, received the Woodstock Film Festival’s James Lyons Editing Award at the 2008 WFF in October, for her work on this year’s acclaimed film Were The World Mine. I was at Woodstock with Nights and Weekends and when the award was announced (Jen wasn’t there), I almost bum rushed the stage to expound upon her total awesomeness, before I remembered my terror of speaking in public. The film’s director and co-writer, Tom Gustafson and Cory James Krueckeberg, were some of the esteemed early screeners of Sorry, Thanks, and if you want to throw a fun screening party: invite the makers of a gay musical fantasy based on “A Midsummer Night’s Dream” to watch a very rough cut of your sparse, talky indie film. A meeting of minds! (they gave us incredible notes, actually.) We love ‘em and wish the World for them. Here’s a link to the Indiewire article: “Dispatch from New York/Woodstock: A True American Maverick Among Fest.” And the press release, with the full list of winners: Woodstock Film Festival Maverick Awards. BLOGS ARE HELL. PICTURE LOCK IS NOT! Actually, picture lock is hell too. JULY 16: We locked picture! It wasn’t easy. It’s a commemorative moment, so we’re making it the first official Sorry, Thanks news entry. As with all things hard-won, the moment itself was insane: we were rushing to finish before midnight, mostly for an unavoidable sound delivery deadline, but also because it was the last time that Lauren, Jen and I would all be able to meet until August (Jen to Greece, Lauren to Alaska, me to paying producing job—wow, it sounds like we’re more monied than we are!). But, chaos out of nowhere: Lauren gets an email saying she’s in the next round of the a screenwriter’s lab, then an immediate addendum email entitled “CORRECTION”… sending us all into a tailspin of doubt and nerves. And as Jen and I are yelling at her to just open the second email already, something goes terribly wrong on Jen’s system and we lose all our changes. And then Lauren remembers her laundry is about to be locked up for the night (far away in Brooklyn, and if not picked up by 8:00, Lauren has NO clothes to take to a very cold corner of the country). Jen goes into manic problem-solver mode and we call every family-operated laundry in Brooklyn. But we still have Reel 4 to contend with and no time … but Lauren will have no clothes! And of course the internet goes out and Lauren’s phone dies and Jen’s trying to use her land line but and we’re all trying to find someone to get Lauren’s clothes picked up in time and we still haven’t locked picture. I think one of us tripped and fell. And I’m pretty sure that I realized I hadn’t had any water to drink all day and I kicked Lauren’s mug across the floor in my scramble to get to the kitchen. And Jen cringed, because that’s a mighty nice carpet she’s got. Is this self-important? This is why we hate blogs! But, the NEWS worthy resolution: a happy ending. Lauren’s script did make the next round, we found someone to pick up her clothes, and I didn’t die of dehydration (a threat I underrepresented up top, and which would have been incredibly sad). AND we locked picture! Blogs are hell, please forgive us. And welcome. Picture locked! You are currently browsing the Sorry, Thanks NEWS & UPDATES blog archives for December, 2008.